Swaraj 744 FE Potato Expert Track Tractor price, specifications, features, applications are under. Swaraj 744 FE Potato Expert Track Tractor fulfill all needs of the farmer. It is implemented with rotavator, cultivator, spraying, haulage, sowing, reaper, threshing and across multiple crops like grapes, groundnut, cotton, castor etc. Here, in this page, you can find Swaraj 744 FE Potato Expert Track Tractor’s price in every state of India, Specifications with a detail of Brake, torque, wheelbase. You can also find mileage, usable application, and features of the tractor. Swaraj tractor gives a budgeted price for this segment of tractors. Swaraj 744 FE Potato Expert Track Tractor price is very competitive for all competitors of Swaraj tractor in this segment. Price of Swaraj 744 FE Potato Xpert tractor in Gujarat, Rajasthan, Punjab, Madhya Pradesh, and Maharastra: Rs.₹ 600,000 /- Ex-Showroom. Below is the quick overview of Swaraj 744 FE Potato Expert Track Tractor. Swaraj tractor is giving best in class features, specifications and budgeted price for this tractor. Swaraj 744 FE Potato Expert Track Tractor Specifications. 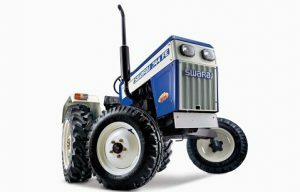 Swaraj 744 FE Potato Expert Track Tractor engine, power, HP, transmission, PTO, Brake, torque, tires, battery, dimensions, etc. Swaraj 744 FE Potato Expert Track Tractor specifications are mentioned below. We give you full specification detail of Swaraj 744 FE Potato Expert Track Tractor below. Standard Mechanical Steering with Heavy Duty single drop arm for better maneuverability & comfort to operator. Lifting Capacity 1700 Kgf at lower link ends. Linkage 3 point linkage suitable for Category-I& II type implement pins. Above mentioned Swaraj 744 FE Potato Expert Track tractor specifications with full detailed information give you needful information regarding tractor. Swaraj tractor is also known for value for money and low maintenance. Swaraj 744 FE Potato Expert Track Tractor mileage is NA. Tractor is maintaining its mileage in every operation work. All tractors of Swaraj tractor is pretty much feature-laden. Swaraj 744 FE Potato Expert Track Tractor features are below mentioned. It is very useful while operating tractor and farming. Operators comfort is very important while we talk about the tractor. Swaraj tractor gives its best in the term of Features. Swaraj 744 FE Potato Expert Track Tractor is implemented with all user applications which are mentioned below. It is working better with all applications which are mentioned. Tractor has enough power to work with applications. Below are all applications which operator can implement with Swaraj 744 FE Potato Expert Track Tractor and work smoothly. Conclusion for Swaraj 744 FE Potato Expert Track Tractor. We tried to give full information of Swaraj 744 FE Potato Expert Track Tractor. Above we include Price, Specification, Features, and Applications of Swaraj 744 FE Potato Expert Track Tractor with detailed information. You can contact us to book your order of Tractor. We will provide full support to you.